Late last year, Tim and Sarah published the second edition of The Twitter Book. It looks very much like the first edition: the cover image is practically the same and you’ll find images on the verso pages and text on the recto pages, exactly like before. Since the book covers topics for beginners as well as advanced users, a lot of the early chapters haven’t changed much. They are still well-written and useful to grasping the concept of Twitter and how to use its basic features. I’ve always been impressed by Tim and Sarah’s evangelism of the Twitter platform—they are passionate about its various uses and try hard to dispel the notion that it’s a niche media for tech geeks or those glued to mobile devices. This notion was more prevalent in 2009 than it is now. My main criticism against the first edition of The Twitter Book still stands in the second edition: the book fails to catch all the great tools being created around Twitter, and can’t cover the ones created after publication. Interestingly, when the first edition was published, desktop Twitter apps like Tweetie and Twhirl were popular; today, Twitter’s own app has supplanted those and I find more growth in online analytics services (like Twittercounter) and online apps built on the API (like fllwrs.com). Neither Twittercounter nor fllwrs.com are in The Twitter Book, and more tools will be released in the future. One suggestion from my review that Sarah Milstein actually commented on was the number of long, full URLs in The Twitter Book. Shortened URLs make perfect sense in a book like The Twitter Book, and the first edition did not take advantage of them. In the second edition, most URLs are actually still full URLs but almost all of them are not long anyway. URLs like http://business.twitter.com/ are not hard to remember or type. There are some bit.ly’d links throughout the book, such as http://bit.ly/dooce-maytag, which show that the suggestion was indeed used for the longer URLs. The second edition of The Twitter Book is an updated resource on Twitter and most of what I send about the first edition applies to the second. I think the book has more competition from online news sources in 2012 compared to 2009, but if you want to read about Twitter and it needs to be ink on paper, pick this book up and enjoy. There’s a small but interesting intersection in the publishing world where self-help, creativity and design meet to produce books designed to help creative people achieve more. The Artist’s Way is one such popular line of books. Another one I particularly like is It’s Not How Good You Are, It’s How Good You Want To Be. Such books are often full of self-help goodness but also sometimes a bit zanier than your usual self-help offerings. 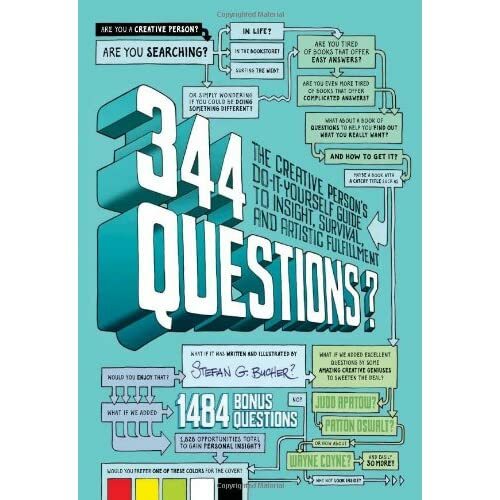 Stefan Bucher’s 344 Questions: The Creative Person’s Do-It-Yourself Guide to Insight, Survival and Artistic Fulfillment cranks the zaniness up a notch. The book is written for people looking for a catalyst for improving their creativity, and offers questions that lead you to new insights about yourself and what makes you most creative. These are the kinds of exercises that any creative person should do now and then. Not many people actually look for self-help like this until they are feeling defeated and their creativity or business is flagging, so a book like this is always timely. The book doesn’t have any answers, just questions in elaborate hand-drawn diagrams with lots of arrows and word bubbles. This makes the book unique. The reader has to supply the answers, and there’s many blank spaces to write in this book. Stefan expects the reader to madly mark up this book with thoughts, ambitions, questions and other notes to spark insight and ideas. It’s the kind of non-linear thinking that creative people presumably enjoy, though more analytical types of people might find it meandering. Can we focus on the immediate essentials? What TV shows distract you? What music perks you up? Do you have an emergency supply of all this stuff? Do you have friends who will listen to you? Do you have friends you’ll listen to? On a scale of one to ten, how bad is [your current difficulty]? This is all on just a half-page. This page will seem magical if it provides you an epiphany (maybe you’ll realize you don’t trust your friends enough to listen to what they say) but if not it can be tiring. “Who cares if a professional commitment is a sacred oath?” It takes a particular individual, perhaps one in search of answers and willing to provide them with a little coaching, to appreciate this book. I recommend it for such people, and for the others I would recommend something more like The Artist’s Way, which delivers a more methodical framework for building creativity in the your work. After a relatively short beta period, Adobe has released version 4 of Photoshop Lightroom, its photography application for management, development and production of digital photography. Adobe has also added some aggressive pricing to Lightroom 4, making it just $149 for the full version and $79 for the upgrade. Lightroom has typically cost $299 for the full version. Tom Hogarty, Lightroom’s main product manager, said, “Lowering the price makes Lightroom more accessible to a broader range of photographers—from pros to amateurs.” This makes sense to me—more and more amateur photographers want to work with professional tools and take their work to the next level—but I also think Adobe wants to compete aggressively with free and cheap photography products on the shelves and online.